Cosmos and Lovage. Sometimes planted with salad greens or other shade-tolerant plants. Start with purchased plants, set out in spring. 30 cm each way is a good spacing for an initial planting of 3 plants. 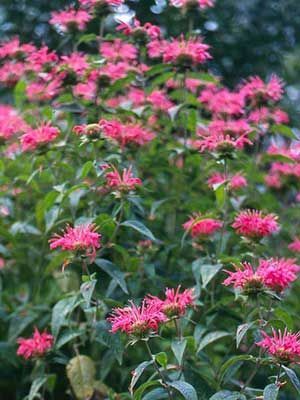 Bergamot is a slight spreader, but not invasive like mint. Over time, a happy plant will form a mound 120 cm high and wide. Attracts bees. Leaves are excellent for tea.